Can I Bake Falafels Instead of Frying Them? Laurel Tuohy was certified as a yoga teacher in 2009 after spending a year honing her craft in India. She has held editorial positions from music critic to lifestyle editor since 2000. She holds a degree in anthropology from Western Connecticut State University and her award-winning articles have appeared in publications around the globe from "The Mirror" to "The Times of India." Making falafels at home can be a bit tricky at first, but after a few batches you'll feel like a pro. You might wonder how to make the tasty little balls more healthful for you and your family, and considered baking instead of frying -- a tried-and-true way of making typically fried food, from battered chicken to french fries, more healthful. It's easy to bake falafels instead of frying them. 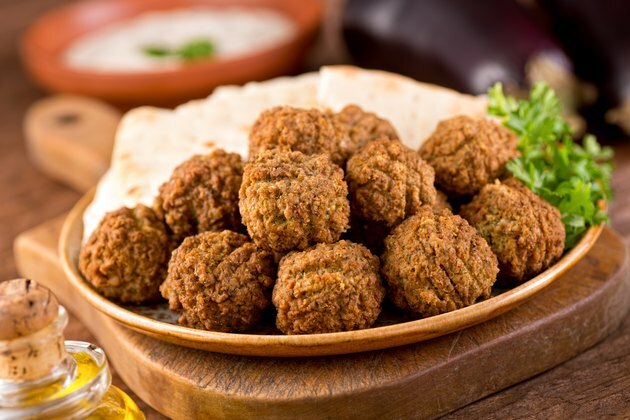 Falafels are an ancient food that likely originated on the Indian subcontinent and have been eaten since biblical times, according to "The New York Times." The deep-fried and spiced balls are made predominantly of ground chickpeas and popular in the Middle East. They most often are served with tahini in a pita pocket or with a yogurt dipping sauce as an appetizer. According to Ellie Kreiger of the Food Network, the preparation for making baked falafels is not so different from that for frying them. The mixture of chickpea, onion, garlic, spices and salt still is put through a food processor and shaped into balls. Instead of tossing them into a fryer however, they are brushed with olive oil and placed on a cookie sheet. Slide them into a preheated 425 degree oven for 20 minutes, flip them over and bake for another 20 minutes. Then serve in the fashion of your choice. Baking food instead of frying cuts back on fat and calories, often without sacrificing much flavor. One tablespoon of oil used in frying adds 14 g of fat to the meal. Adults should get no more than 20 percent to 35 percent of their daily calories from fat. To make your falafels even healthier, try some of these substitutions: Instead of white pitas, try whole wheat versions to add extra fiber to your diet. Swap iceberg lettuce for baby spinach to sneak some iron and folic acid into your diet. Tahini is delicious but the sesame paste-based sauce is high in fat and calories; try substituting plain yogurt at room temperature for a tangy bite in your pita.